Parkinson's disease is the second most common disease among central neurodegenerative diseases and is characterized by loss of dopaminergic neurons in the central nervous system. It has been shown in studies that Parkinson's disease is a neurodegenerative disease and affects many parts of the brain such as smelling, mental functions, and many systems, including the intestinal system before the typical symptoms of the disease develops., Dopamine is also a major neurotransmitter in the retina as well as in motor function. Dopamine is also important in controlling the efficacy of other neurochemical systems such as gamma-aminobutyric acid and glycine and glutamate in the retina. It is possible that the decreased dopaminergic inputs in ganglion cells contribute to the abnormal production of glutamate and the atrophy of the nerve fibers. In Parkinson's disease, dopamine dysfunction has been shown in the retina as well, as in the basal ganglia. PD patients have some specific visual impairments such as color vision and contrast sensitivity (CS) and difficulties in complex visual tasks. In our study, we aimed to evaluate the retinal nerve fiber layer analysis (RNFL) and ganglion cell complexes (GCCs) by optical coherence tomography (OCT) and cognitive functions with mini–mental state examination (MMSE) which may be markers of neurodegeneration in Parkinson's disease and to examine the relationship between these parameters and the duration and the stage of the disease. Twenty-two patients who are being followed-up with Parkinson's disease in neurology outpatient clinic between January 2016 and August 2016 and 22 healthy controls have been included in the study. A detailed eye examination including visual acuity, intraocular pressure (İOP) measurement, biomicroscopic examination, and dilated fundus examination were performed for all participants. Patients whose best-corrected visual acuity (BVAC) is 0.5 or more measured by Snellen chart, whose İOP is 21 or less, with no >3 spherical >5 cylindrical deficiency, who do not have any opacity that inhibit OCT measurement in cornea or lens, without any retinal disease (macular degeneration, diabetic retinopathy, etc. ), optic nerve disease (glaucoma, optic neuropathy, etc. ), and who have no eye trauma or surgical history were included in the study. Fourier-Domain OCT, an ultra-high-resolution OCT device, (RTVue-XR Avanti; Optovue Inc., Fremont, CA, USA) was used to measure retinal parameters. This system operates at 840 nm wavelength and has an axial scanning speed of 70,000/s and a resolution of 5 μm. With this device, GCC thickness measurements could be obtained as well as the RNFL thickness measurement. It was possible to distinguish the inner three layers of the retina (the nerve fiber layer, the ganglion cell layer, and the inner plexiform layer in the normal retinal layer using the “GCC” scanning protocol. In the measurement of RNFL, a circular section with a diameter of 3.45 mm was used as a standard and the mean nerve thickness and measurements of the upper and lower nasal and temporal quadrants were taken in microns. In GCC measurements, three thickness parameters; mean GCC and lower and upper quadrant measurements, were taken in microns. OCT measurements were performed after pupil dilatation was ensured with 1% tropicamide by the same physician and measurements with a signal strength indicator > 50 were considered as reliable and used for analysis. The diagnosis of Parkinson's disease was made according to the criteria of the UK Parkinson's Disease Society Brain Bank. The patients were scaled using the Unified Parkinson's Disease Rating Scale (UPDRS) and Hoehn–Yahr staging (HYS) by a neurology specialist. HYS was used for staging and UPDRS was used for clinical level of seriousness. UPDRS comprises four main parts, in which the mental status, daily living activities, motor functions, and treatment complications of the patients are assessed. Totally, 42 items of the test are assessed by scoring them between 0 and 4. High score indicates bad state. The HYS Scale is a staging system in which the severity of the patient's disease and the progression can be assessed. This is a short, useful, and standardized test that is frequently used all over the world in assessing the global cognitive level. The test comprises 11 items which are grouped under five main titles, namely, orientation, recording memory, attention and calculation, recall, and language are evaluated over the total score of 30. It was published for the first time in 1975 by Folstein et al. The validity and reliability study for educated people in Turkish society was conducted by Güngen et al.in 2002, and the validity and reliability study for the uneducated and illiterate people was conducted by Yıldız et al. in 2015. In both studies, it was determined that MMSE was a valid and reliable test for the Turkish population, with an ideal threshold value of 23/24 for mild dementia diagnosis. In addition, we aimed to investigate the effect of the UPDRS score and the duration of the disease on OCT and MMSE values. All participants signed informed consent. The study was approved by the local ethics committee in Bursa Training and Research Hospital and was conducted in accordance with the Declaration of Helsinki. The mean age of the 44 participants included in the study was 66.48 ± 6.26 years and 21 (47.7%) of them were female and 23 (52.3%) of them were male. 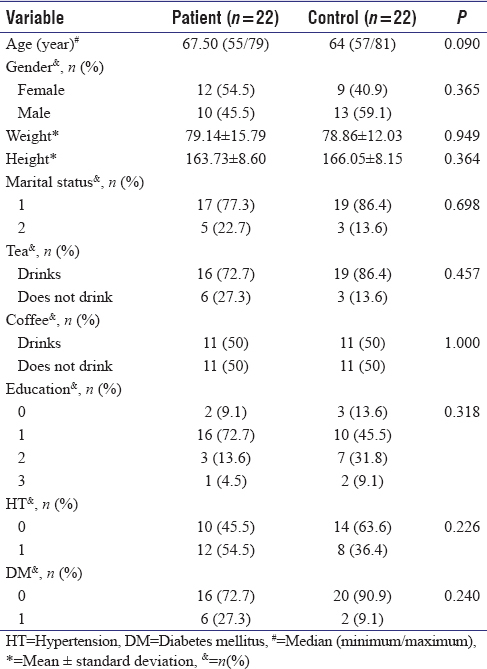 Patient and the control group were similar regarding their demographic characteristics [Table 1]. According to HYS, 68.2% of the patients were stage 1, 13.6% were stage 2, and 18.2% were stage 3. Mini–mental test total (MMTT) value (P = 0.025) and language value (P = 0.021) was lower in the patient group compared to the control group [Table 2]. OCD measurements were not different between groups [Table 3]. However, in patients, there is a reverse significant correlation between UPDRS-T and GCC-left-s (r = −0.495; P = 0.026), GCC-left-i (r = −0.517; P = 0.019), and GCC-left-to (r = −0.508; P = 0.022). There is a significant parallel relation between Recall and RNFL-right-tot (r = 0.626; P = 0.039). The Shapiro–Wilk test was used to check whether the data are normally distributed. In comparison of two independent groups, Independent sample t-test was used for data that have normal distribution, and Mann–Whitney U test was used for data that have nonnormal distribution. Variables that met the normal distribution criteria are given with mean ± standard deviation and those that did not meet the criteria are given with median (minimum/maximum) values. The Pearson Chi-square test and the Fisher exact test were used to compare the categorical variables and were given as n and percentage values. Relations between the variables were examined by Spearman correlation coefficient. α was considered to be 0.05. Statistical analyzes were carried out in the IBM SPSS Statistics 21 program (IBM SPSS, Chicago, IL). In our study, no statistically significant differences were found between the control group and the Parkinson group in the RNFL analyzes and GCC evaluated using OCT. In an OCT study carried out by Inzelberg et al. on patients with Parkinson's disease, they found thinning within the inferotemporal area in the Parkinson group. Moschos et al. has found differences in RNFL thickness of Parkinson's patients, particularly in the inferior and temporal quadrants. In our study, the reason of not having a significant difference in the RNFL in the Parkinson group may be due to the low number of samples and due to the fact that 68.2% of the patients with Parkinson's disease were in Stage 1 according to HYS. In a study comparing 17 PD and 11 controls, carried out by Altintaş et al., it was found out that the mean RFNL thickness decreased significantly, being prominent in the total macular volume and superior quadrant when compared to the control group. There was an inverse correlation between UPDRS total score and motor scores and the mean total macular volume. In a study with 61 Parkinson patients and 30 healthy controls, a significant parafoveal inner nuclear layer thinning was detected in the Parkinson group. However, no differences were observed in other retinal layers, including the RNFLretinal nerve fiber layer, and total macular thickness. In terms of visual hallucinations, only the thickness of the RNFL varied between the PD subgroups, while the total macula thickness and thickness of the other retinal layers were not different. The RNFL was detected to be the thinnest within the group with hallucinations with no dementia, and the group that was indicating hallucinations with dementia followed that one, and the nonhallucinating nondementia group followed the latter. There was no significant correlation detected between the retinal thicknesses and duration or severity of PD and drug doses. The results indicated that thinning of the RNFL may be associated with visual hallucinations in patients with PD and no dementia. In another study, no difference was found between PD and controls in RNFL thickness, similar to our study. A negative correlation was detected between right nasal superior quadrant RNFL and central macular thickness and the UPDRS motor scores. The outer retinal layer was found to be thinner in PD patients in the right nasal quadrant and right inferior quadrant. In another study with 153 PD and 242 controls, all the macular parameters except RNFL parameters and fovea thickness showed significant differences between controls and patients. HY scores showed significant and inverse correlation with all the macular parameters measured by OCT and with the RNFL thickness. 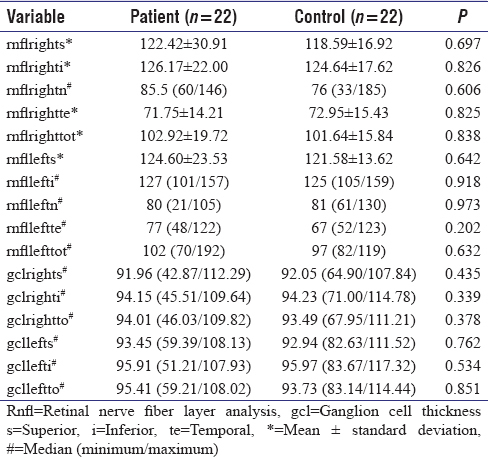 In our study, similar to the literature, there was a significant correlation between the UPDRS-Total score and ganglion cell thickness, which is a more sensitive method than retinal nerve thickness. In another study, the mean RNFL thickness was found to be decreased in PD in all quadrants. There was a negative correlation between RNFL thickness and UPDRS score and the duration of the disease. In this study, it was argued that measuring OCT and RNFL thickness could be a successful biomarker in early detection of disease and in the progression of the disease. In a study in which the profiles of visual impairment of mild-to-moderate PD patients without dementia and their association with motor and cognitive dysfunction were examined, 76 mild-to-moderate PD patients were compared with 116 controls. The participants were evaluated in terms of visual acuity, CS, processing and visual speed of attention, spatial and emotional perception, visual and verbal memory, executive functions, depression, and motor functions. Inadequacy of visual attention and the spatial perception was found to be correlated with deterioration in cognitive function. There were correlations observed between visual speed tests of processing and attention, spatial and motional perception, deterioration in visual structural and executive functions, and the postural stability and walking difficulty. Although the majority of our patients were at the early stage of the Parkinson's disease, the MMTT value and the language value in the mini–mental test were lower in the patient group than in the control group. In our study, a parallel significant correlation was observed between the recall section of the mini–mental test and the thickness of the right retinal nerve fiber. This finding indicated that neurodegeneration in Parkinson's disease affects many parts of the brain simultaneously. In our study, the negative correlation between UPDRS score and ganglion cell amount and the relationship between MMSE recall modalities and RNFL indicate that the neurodegeneration continues multisystemically and neurodegeneration increases simultaneously with the disease. The noninvasive method, OCT, can be used as an indicator regarding the development of dementia. There is a need for larger scaled follow-up studies indicating that other systems are influenced simultaneously as well, and in which the examination mechanism of the RNFL is brought into the light. Braak H, Del Tredici K, Bratzke H, Hamm-Clement J, Sandmann-Keil D, Rüb U, et al. Staging of the intracerebral inclusion body pathology associated with idiopathic Pazrkinson's disease (preclinical and clinical stages). J Neurol 2002;249 Suppl 3:III/1-5. Chaudhuri KR, Healy DG, Schapira AH, National Institute for Clinical Excellence. Non-motor symptoms of Parkinson's disease: Diagnosis and management. Lancet Neurol 2006;5:235-45. Braak H, de Vos RA, Bohl J, Del Tredici K. Gastric alpha-synuclein immunoreactive inclusions in Meissner's and Auerbach's plexuses in cases staged for Parkinson's disease-related brain pathology. Neurosci Lett 2006;396:67-72. Inzelberg R, Ramirez JA, Nisipeanu P, Ophir A. Retinal nerve fiber layer thinning in Parkinson disease. Vision Res 2004;44:2793-7. Djamgoz MB, Hankins MW, Hirano J, Archer SN. Neurobiology of retinal dopamine in relation to degenerative states of the tissue. Vision Res 1997;37:3509-29. Weil RS, Schrag AE, Warren JD, Crutch SJ, Lees AJ, Morris HR, et al. Visual dysfunction in Parkinson's disease. Brain 2016;139:2827-43. Moschos MM, Tagaris G, Markopoulos I, Margetis I, Tsapakis S, Kanakis M, et al. Morphologic changes and functional retinal impairment in patients with Parkinson disease without visual loss. Eur J Ophthalmol 2011;21:24-9. Altintaş O, Işeri P, Ozkan B, Caǧlar Y. Correlation between retinal morphological and functional findings and clinical severity in Parkinson's disease. Doc Ophthalmol 2008;116:137-46. Lee JY, Kim JM, Ahn J, Kim HJ, Jeon BS, Kim TW, et al. Retinal nerve fiber layer thickness and visual hallucinations in Parkinson's disease. Mov Disord 2014;29:61-7. Mailankody P, Battu R, Khanna A, Lenka A, Yadav R, Pal PK, et al. Optical coherence tomography as a tool to evaluate retinal changes in Parkinson's disease. Parkinsonism Relat Disord 2015;21:1164-9. Satue M, Seral M, Otin S, Alarcia R, Herrero R, Bambo MP, et al. Retinal thinning and correlation with functional disability in patients with Parkinson's disease. Br J Ophthalmol 2014;98:350-5. Jiménez B, Ascaso FJ, Cristóbal JA, López del Val J. Development of a prediction formula of Parkinson disease severity by optical coherence tomography. Mov Disord 2014;29:68-74. Uc EY, Rizzo M, Anderson SW, Qian S, Rodnitzky RL, Dawson JD, et al. Visual dysfunction in Parkinson disease without dementia. Neurology 2005;65:1907-13.